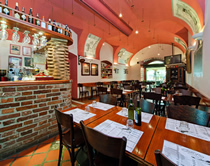 Corto is a family run pizza and pasta restaurant, ideally located between the Old Town Square and Wenceslas Square, just two minutes walk from both. Corto is the oldest Italian restaurant in the city centre, and is set in a charming 14th century building. During the day, the surrounding area buzzes with life, because Prague's main market, Havel's Market, is right outside. While at night, it has all the character of the lamplit Old Town. Corto serves high quality pizza and pasta, prepared using fresh locally sourced ingredients, and served by friendly staff. To accompany the food there is Czech and Italian wine, draught Czech beer, and a range of spirits and hot and cold soft drinks. For most of the year there is also the option of dining outside on the terrace, which looks out to the market. Corto is suitable for a variety of occasions, from a nice relaxed meal for two to friends and family gatherings. They also serve a range of fine breakfasts. For moderately priced Italian food and drink in the heart of the city, in a warm friendly restaurant, Corto is a good choice. Corto is ideal for groups on a budget looking for quality food in nice warm surroundings, in the heart of the city. The restaurant is suitable for groups of friends and families, hen nights, stag parties and student groups. Advance reservations are essential.